When considering a holiday destination for the entire family, Cairns – one of Queensland’s many cities which was founded in 1876 – might not be the first place that comes into your head. If you’re lucky enough to have been to Australia before, then you’ll know how naturally beautiful the country is, with spectacular tourist hotspots all around the coast. If you’ve never been to Australia, or Queensland for that matter, then maybe it’s time to start thinking about a new type of holiday. A holiday where the cooling sea breeze can be felt anywhere in the city, amazing theme parks stay open all night long, and restaurants serve the freshest of Australian cuisine. Let’s take a look at what the city of Cairns has to offer the traditional tourist this year. One of the city’s biggest and most popular highlights is the Foreshore Promenade, a saltwater swimming lagoon spread over 4,800 square meters! 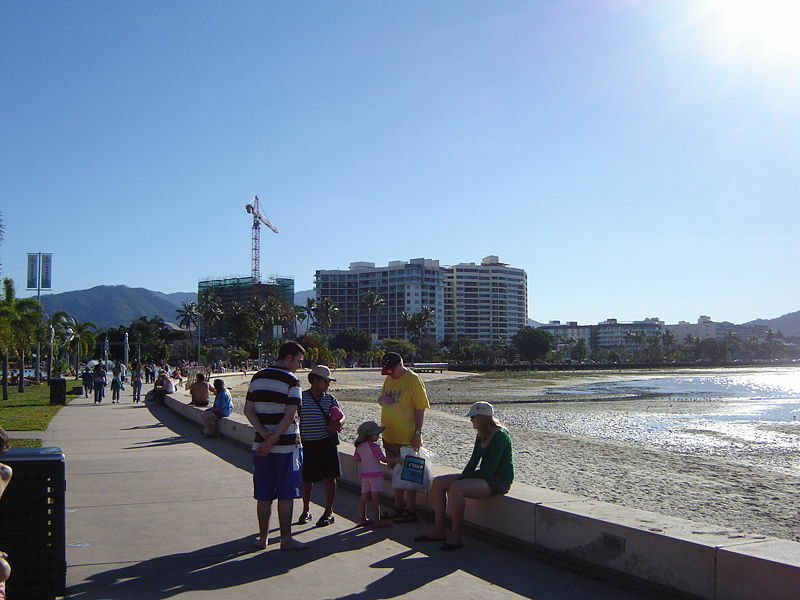 Not only is it a standout piece of architecture in the surrounding landscape, but because Cairns doesn’t actually have a beach, it is a very important social and cultural attraction for locals as well as tourists. Located in the heart of the city, it’s the number one place to go, whether you’re a fitness freak looking to get some early-morning lengths in, or if you’re in need of some child-friendly entertainment for the day. There’s even a great walking and cycling trail around the Foreshore Promenade, stretching for over 3 kilometers, and there are plenty of market stalls, shops and restaurants to sink your teeth into once you’re all dried off! Another of Cairns great tourist attractions, you’ll easily be able to spend an entire day at the Tkapukai Cultural Park. From the Creation Theatre to the amazing actors, holograms, museums and abundance of spectacular sights to see, this park is the perfect place to bring the kids, not least for the wealth of natural knowledge they’ll receive here. You can even spend the night at Tjapukai Cultural Park, sleeping in some of the handmade log cabins right by the lake. You’ll be cooked an even meal over a campfire, and if it’s the right time of year, you might even get to see turtles making their way up the shoreline to lay their eggs! Located around 15km north of Cairns city centre, there are numerous busses that take to Tjapukai Cultural Park. Be sure to check out the great deals on flights to Cairns at http://www.cheapflights.com.au/flights-to-Cairns/. Travelling to Australia doesn’t have to cost you an arm and a leg, so compare prices online before you book! The Flecker Botanic Gardens are a spectacular place to spend the day with the family, especially if you’ve got young children as you can picnic on the lush open grass. From sections of rainforests to tropical plants and birds, there’s so much to see here that you won’t know where to begin. Thankfully, there are very knowledgeable tour guides available, who will take you around the gardens, explaining all the beautiful horticulture. There’s also a great café here too, meaning you can take breaks throughout the day to enjoy some local cuisine!